John is a Director of Sentry Ltd. as well as Business Manager for Sentry Norfolk. 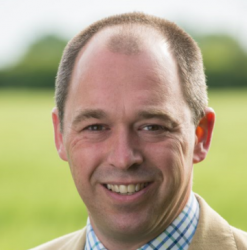 John joined Sentry in 1997 as a Trainee Farm Manager on farms in Hertfordshire and Bedfordshire before spending three years as Assistant Manager at Sentry Dorset. In 2001 he moved to a 1200 acre arable business in Norfolk. This business has grown to 3500 acres managing 9 farms with a team of 4 full time employees and one apprentice. He is BASIS, BETA and FACTS qualified and also heads up Sentry Marketing. He completed a Worshipful Company of Farmers course on Rural Leadership in 2004. He oversees a further 11,250 acres in East Anglia. John joined the Board of Sentry Ltd in October 2016.